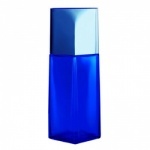 L'Eau Bleue d'Issey pour Homme is a mysterious fragrance with aromatic notes of lemon grass and rosemary enveloped by the warmth of the sandalwood. 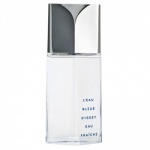 L'Eau Bleue d'Issey Eau Fraiche is a fresher approach lifted by hints of mint, bergamot and pink pepper still surrounded by sandalwood and patchouli. A uniquely audacious and enveloping Eau de Toilette. An aromatic scent with a woody sillage.